Which way should the gas go? With 50 to 100 earthquakes recorded daily, including an average of one magnitude-7 event every year and a magnitude-8 or larger event every 13 years, Alaska is by far the most seismically active region in North America. The 1964 magnitude-9.2 earthquake in southern Alaska slightly edges out the December 2004 northern Sumatra event as the second largest earthquake ever recorded. As a result of its seismicity, parts of Alaska pose formidable challenges for designing and building structures to safely withstand earthquake forces and seismically induced ground failures. A success story in pre-earthquake engineering, the Trans-Alaska Pipeline System, shown here at the Denali Fault crossing after a magnitude 7.9 earthquake on Nov. 3, 2002, slipped 5.5 meters (18 feet), offsetting the Richardson Highway (upper left). No oil was spilled as a result of the quake, and operation of the pipeline resumed within a few days after the earthquake. Photograph is by Gary Carver. Alaska is also rich in natural resources, including oil and natural gas, producing about 928,500 barrels of oil daily, or 20 percent of all U.S. production in 2005. So the question then becomes: Can a pipeline intended to carry critically important commodities for many decades be safely built and operated across such a seismically active region? This question was answered Nov. 3, 2002, when the Denali Fault in central Alaska slipped approximately 5.5 meters (18 feet) laterally and more than 1 meter (3 feet) vertically beneath the Trans-Alaska Pipeline during a magnitude-7.9 earthquake without causing a single drop of oil to spill. Although no significant historic earthquakes had previously been attributed to the Denali Fault, geologists during the early 1970s recognized the fault’s earthquake potential and recommended a design along a 600-meter section to accommodate slippage up to 6 meters in a magnitude-8 earthquake. The event the geologists forecasted occurred 30 years later. (In geologic studies following the earthquake, tree-ring evidence showed that a magnitude-7.2 earthquake in 1912 had occurred along the same trace of the fault.) Engineers accommodated the predicted ground motion by incorporating a zigzag design supported on Teflon sliders, allowing the pipe to flex and the ground to slide beneath it. With proposals now being considered to build a natural gas pipeline, it is ever-important to understand the seismic hazards along potential routes, so that the pipeline and its spurs can be properly designed and managed for seismic safety. Many variables will surely play into the construction of the natural gas transporter; fortunately, earth scientists already know much about the geology and seismology of the region, and they have learned much more in the 30 years since the oil pipeline’s construction. Until now, getting any of the estimated 35 trillion cubic feet of proven natural gas reserves on the North Slope to market has been considered uneconomic due to the remoteness of the area, relatively low commodity prices and high costs of suitable transportation. Therefore, nearly all of the natural gas that is produced from oil wells in the Prudhoe Bay area is reinjected for storage and to help maintain reservoir pressures for oil recovery. Because of the economic and logistical hurdles, natural gas on the North Slope has been considered “stranded.” Rising energy prices and recent shortages of heating fuel across the United States, however, have sparked renewed interest in marketing this stranded gas and developing new domestic gas sources. North Slope oil producers and other companies are stepping up their exploration for new gas reserves. The state of Alaska is also keenly interested in getting the gas to market because of the significant potential revenue it will bring to the state in the form of taxes and royalties. In addition, a pipeline through Alaska could provide affordable energy for homes and businesses in local communities. The state of Alaska has received three formal proposals for construction of a pipeline and possible spur lines to deliver natural gas from the North Slope to U.S. and world markets (see sidebar). A fourth, “over-the-top,” alternate route involves a submerged pipeline extending from Prudhoe Bay eastward through the Beaufort Sea to Canada’s Mackenzie Delta, but is opposed by the state of Alaska and Congress and is not under consideration. Two of the proposals under consideration follow the same route, paralleling the existing Alaskan oil pipeline for approximately 880 kilometers from Prudhoe Bay to Delta Junction, then turning southeast and following the Alaska Highway to a hub in Alberta, Canada. In the third proposal, the gas pipeline would follow the oil pipeline for its entire length to a liquefied natural gas plant near Valdez, where the liquid gas would be transferred to ships for export. All of these proposals allow for the pipeline to be tapped for delivery of gas to Alaska communities via various spur lines. The routes these spur lines take will have great bearing on the pipeline system’s exposure to seismic hazards. Earthquake hazards do not currently compete with economic and political factors in selection of a pipeline route, but will figure prominently into the design and engineering once the route has been determined. If the gas pipeline follows the route of the oil pipeline for its entire route from Prudhoe Bay to Valdez, the seismic hazards to which it is exposed will be similar. A key difference, however, is that in current proposals the entire gas pipeline will be buried to avoid explosions from accidents or sabotage. Clearly, innovative engineering will be necessary where the gas pipeline crosses active faults, including possibly elevating the line, or placing it in aboveground embankments or in specially designed trenches in those zones. A separate but significant hazard will be the effect of permafrost and frost heave on the gas line, especially in light of the opinion of many scientists that global warming will raise temperatures enough to melt ground ice in some areas during the coming decades. All of the proposed gas pipeline routes cross active seismic zones in the Fairbanks region north of the Denali Fault, though none of these zones are associated with mapped surface fault traces. Surprisingly, three shallow magnitude-7-plus earthquakes have shaken the area within 80 kilometers of Fairbanks during the past century with no discernable surface rupture so far. Most earthquakes in this area are associated with zones of seismicity that line up in a northeast-southwest direction between the Denali and Tintina-Kaltag fault systems. If the gas pipeline follows the Alaska Highway from Delta Junction into Canada, as proposed in two of the plans, it will cross additional northeast-trending faults. This part of the route is an area of relatively low seismicity; however, published and unpublished geologic studies have identified several northeast-trending faults north and south of the corridor and faults along the northeast front of the Alaska Range mountains adjacent to the corridor, with known or suspected geologically recent activity. Some of the northeast-trending faults may be continuous across the pipeline route. Continuing along the two plans’ route to Canada, an additional risk could come from soil liquefying during an earthquake. Such “liquefaction” can cause an improperly designed pipeline to rise bouyantly, as it may be lighter than the surrounding soil, creating stresses that could cause the pipes to crack or break. Lateral spreading or flowage of the soil, which are common consequences of liquefaction on sloping ground, could also break the pipeline. Liquefaction was extensive in lowlands between Tok and the Alaska-Canada border during the 2002 Denali Fault earthquake, causing extensive damage to roads and an airport runway. If the gas pipeline continues along the Alaska Highway through Canada, it will follow the Denali Fault trench for about 200 kilometers in southwestern Yukon before turning eastward toward Whitehorse. This portion of the Denali Fault shows extensive evidence of geologically recent activity and could pose significant seismic risk; however, the 2002 rupture took a turn southward along a splay called the Totschunda Fault rather than following the main strand into Canada. Whether future activity on this part of the system will return to the Denali Fault or shift to the Totschunda and other faults to the southwest is not known. The alternative, third, route to Valdez crosses the Denali Fault, like the oil pipeline, and crosses the smaller Donnelly Dome and McGinnis Glacier faults in the Alaska Range north of the Denali Fault. Additionally, where the pipeline approaches its southern terminus in Valdez, the pipeline and proposed liquefied natural gas plant would be subject to potentially very strong ground shaking from large earthquakes in the Alaska-Aleutian subduction zone — the source of the 1964 magnitude-9.2 earthquake. Also important to consider are proposed spur lines from Fairbanks and Glennallen to the Anchorage area, which will traverse highly seismically active regions, with most historic earthquakes originating in the Benioff zone of the Alaska-Aleutian megathrust. In addition to the Denali Fault, a pipeline from Fairbanks to Anchorage along the Parks Highway would cross the Castle Mountain Fault in the lower Susitna River Valley. About 50 kilometers east of the highway, this fault was the source of a magnitude-5.7 earthquake in 1984 and a magnitude-4.6 earthquake in 1996, although neither resulted in recognized surface rupture. In its currently aseismic western section near the Parks Highway, the Castle Mountain Fault shows clear evidence of geologically recent activity. Paleoseismic studies there suggest evidence of four prehistoric earthquakes in the past 2,700 years, indicating an average recurrence interval of about 700 years. With 600 to 700 years since the last significant offset, the Castle Mountain Fault may be due for a magnitude-6 to -7 event. Recent studies also suggest the presence of a fold-and-thrust fault belt with possible recent activity in foothills of the Alaska Range north of the Denali Fault. This finding could mean that the risk to spur lines crossing the Alaska Range in this area is higher than previously thought. And although a spur line from Glennallen to Anchorage would not cross known active faults, it would be subject to ground shaking from subduction-zone events, and it comes into close proximity to the Castle Mountain Fault. To better understand the geologic hazards along the proposed gas pipeline corridor for two of the proposals, the Alaska Division of Geological & Geophysical Surveys (DGGS) initiated a study in 2005 of geologic hazards along the 300-kilometer segment between Delta Junction and the Alaska-Canada border. This study includes detailed geologic mapping of a 20-kilometer-wide swath along the corridor, as well as fault studies in and near the corridor to evaluate seismic and other hazards. In addition, the Department of Mining and Geological Engineering at the University of Alaska in Fairbanks is compiling data on the geology and hazards in Canada for a proposed extension of the Alaska Railroad along the same corridor. DGGS conducted a high-resolution airborne geophysical survey in 2005 to aid the geologic mapping in this area of extensive vegetation and soil cover and to help determine whether suspected active fault zones are continuous across the corridor. Preliminary interpretation of the geophysical data indicates that at least one of the fault zones extends more than 25 kilometers across the corridor, although there is no evidence yet of geologically recent activity. This fault zone, as well as others, will be the focus of studies over the next two to three years to determine slip rates and the age of the most recent displacement. When DGGS completes its evaluation, the relative seismic risk of the route between Delta Junction and the Alaska-Canada border can be determined and the pipeline designed accordingly, if it takes this route. Meanwhile, although that portion of the proposed pipeline traverses an area of low seismicity, it does not necessarily translate to low risk; seismicity along the Denali Fault was very low prior to the 2002 event. Clearly, the presence of faults with evidence of geologically recent offset in and near this corridor justifies increasing the number of seismic instruments there and collecting detailed geologic data. Furthermore, if the pipeline continues to follow the Alaska Highway through Canada, its design must take into account probable high seismic hazards for the portion of this route that would follow the Denali Fault in southwestern Yukon. Perhaps, however, the greatest seismic risk posed is to the proposed spur pipeline route along the Parks Highway from Fairbanks to Anchorage because it crosses portions of the Denali and Castle Mountain faults that appear overdue for an earthquake, as well as a belt of possibly active thrust faults along the foothills of the Alaska Range north of the Denali Fault. A recent GPS survey along the Parks Highway shows that strain is accumulating across that section of the Denali Fault zone at a rate comparable to that of the section that ruptured in 2002. This strain could be released in an earthquake any time in the next few years, decades or even centuries. Seismicity data provided by the Alaska Earthquake Information Center shows the region’s activity during the past 100 years (colored dots), known and suspected recent surface faults (black), and proposed natural gas pipeline routes (white). Image is courtesy of Rod Combellick. A gas pipeline that follows the existing oil pipeline to Valdez also has some risk, as it crosses the portion of the Denali Fault that ruptured in 2002 and would terminate in the rupture area of the 1964 earthquake. Because significant strain already has been released, however, the risk from repeats of these earthquakes is probably low for the operational lifetime of the oil and gas pipelines. Still, designs should accommodate the possibility of similar events and utilize all available data on other earthquake sources along the route. The 1964 and 2002 events provided valuable engineering data, including probable upper bounds on ground-shaking forces and fault offsets to be expected from earthquakes on those source zones. In the end, regardless of the route selected for the proposed Alaska natural gas pipeline, seismic hazards will be a major consideration in design, construction and operation. As demonstrated by the successful performance of the Trans-Alaska Pipeline during the 2002 Denali Fault earthquake, however, seismic safety is possible even in one of the most seismically active areas of the world. Building and operating pipelines safely in earthquake country depends on acquisition of reliable geologic and seismic data, and the proper use of those data in design and construction. Nearly 40 years after the discovery of vast reserves of natural gas on Alaska’s North Slope, a growing cast of characters is competing for its control. The state of Alaska’s governor, Frank Murkowski, was forced to cede the field when he was voted out of office in August. Once elected this month, Murkowski’s successor, however, will be among the remaining players — which includes the Alaska Gasline Port Authority, multiple oil companies based in the United States and Canada, Alaskan state agencies, conservationists, scientists and other U.S. politicians. All are battling it out over how to send the gas to the lower 48. Two primary paths for a pipeline are currently on the table. One path, proposed by the Alaska Gasline Port Authority (AGPA) — a coalition formed by several Alaskan cities, including the city of Valdez — would rescue the “stranded” gas by piping it along a route that follows the Trans-Alaska Pipeline System from Prudhoe Bay to the Port of Valdez. There, the gas would be compressed into liquified natural gas (LNG), shipped to Kitimat, Canada, and transported by pipeline to Edmonton. That project — touted by its proponents as an “all-Alaska” pipeline because it keeps potential future jobs in Alaska, rather than Canada — hinges on the construction of a plant to convert the gas to its liquid state to reduce its volume. A July report by the Anchorage Chamber of Commerce, however, stated that AGPA’s project, particularly construction of the LNG facility at Valdez, would be prohibitively expensive, and that AGPA currently lacks the funds to complete it. The second proposed pipeline would also follow the Trans-Alaska Pipeline System to Delta Junction, but would then track the Alaska Highway east into Canada. That route, known as the “southern route,” was first approved by President Carter and Congress in 1977, when the reserves at Prudhoe Bay were discovered. It is still the favored route by many, including both Murkowski and environmental groups, such as the Northern Alaska Environmental Center. These groups agree on little else, however. Murkowski’s proposed contract with oil companies BP, ExxonMobil Corporation and ConocoPhillips to build a pipeline along the southern route was unpopular with the Alaskan public and environmentalists alike. Critics said that the $25 billion contract was negotiated in private and not only included unfavorable tax rates for the state and subsidies for the oil companies, but also provided far too many immediate incentives to the companies without providing a definite start date for pipeline construction. Half a dozen Alaskan officials, including the former director of the Alaska Division of Oil & Gas, Mark Myers (newly confirmed as director of the U.S. Geological Survey), resigned after Murkowski’s dismissal of Tom Irwin, commissioner of the Department of Natural Resources (see story, this issue). Irwin had written a memo that was critical of the governor’s gas pipeline negotiations. 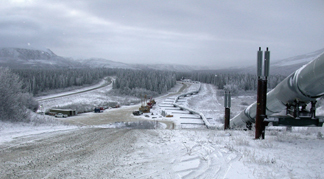 Additionally, some Alaska environmentalists say that the contract as it exists does not actually confirm a definite pathway for the pipeline — leaving open the possibility that its route could be altered to traverse environmentally sensitive areas without offering the public or environmental groups the opportunity to comment, according to a statement by the Northern Alaska Environmental Center. One such alternate route that has been considered, known as an “over-the-top” route, could take the pipeline north from Prudhoe Bay and across the Beaufort Sea into the Mackenzie Delta region of Canada. Murkowski, who leaves office in December, called his proposal “the only game in town.” His potential successors, however, have said they intend to consider other proposals, including the AGPA proposal, and proposals by Warren Buffett’s MidAmerican Energy Holdings Company and the Canadian pipeline firm TransCanada. Murkowski’s defeat may also be a setback for the Bush administration, which has pushed the Alaska legislature to move more quickly on building a pipeline. In June, the U.S. government approved legislation to expedite permitting and construction of the pipeline, and a July report by the Federal Energy Regulatory Commission to Congress on the progress of the project warned that “action needs to be taken now” to develop Alaska’s gas reserves, or the foreign market will rush in to fill the gap. Combellick is deputy director of the Alaska Department of Natural Resources’ Division of Geological & Geophysical Surveys. E-mail: rod_combellick@dnr.state.ak.us.